Three tours. Three events. One weekend. Welcome to professional fishing in 2019. For the first of two times this year, all three major tours held tournaments in the same weekend. The Bass Pro Tour headed to Lake Chickamauga, where hometown legend and former No. 1-ranked Andy Morgan brought home his first title since 2007. The BASS Elite Series went to the expansive Winyah Bay area, where Stetson Blaylock also won for the first time since 2009. And last but not least, the FLW Tour lit up Lake Cherokee, with Andrew Upshaw going wire-to-wire for his first major victory. Morgan got back to his winning ways doing what he does best: powerfishing shallow cover with a lipless crankbait, vibrating jig and a bit of flipping. Meanwhile, Blaylock did the majority of his damage pitching a wacky-rigged YUM Dinger in a tiny canal up the Waccamaw River. And Upshaw ran specific stretches of shoreline rocks, picking off spawning smallmouth with a wacky-rigged 4-inch Strike King Ocho. Now, with all those events in one weekend, we were bound to see plenty of shuffling in the two-year Majors Ranking. And we most certainly did … except at the top. Jacob Wheeler, Edwin Evers, Brandon Palaniuk and Justin Lucas stayed strong in the top-four positions after all had good weekends, though Evers had the best and continues to close the gap on Wheeler. Bryan Thrift and Brent Ehrler both moved up a spot at Ott Defoe stumbled to seventh. Aaron Martens, Jordan Lee, and Jason Christie round out the top 10, with Brandon Cobb falling out to make room for Lee. As for the winners, Andy Morgan was ranked No. 1 for the longest time before having a miserable 2018. He’s back on the upswing and is now ranked 53rd. After a second-place finish and a victory, Blaylock has jumped from 63rd to 35th in the last couple weeks. And Upshaw’s big victory has him working his way back to double digits, as he’s now ranked 132nd. 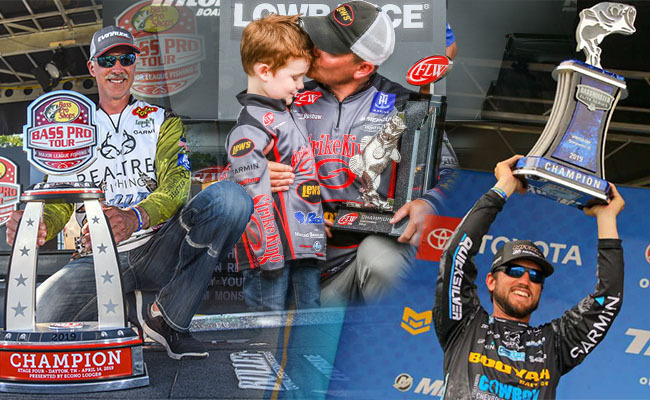 Get the complete list of 2-year Pro Anglers - MLF. The 2-year Pro Anglers - MLF ranking is a blend of both FLW and BASS sanctioned events taking into consideration each circuit's qualification criteria, and is based on the past 2 years (24 months), with a 0 tournament minimum, and includes BASS Elites, Bassmaster Classics, FLW Tour, Forrest Wood Cups, and TTBC events. Get the complete list of 1-year Pro Anglers - MLF. The 1-year Pro Anglers - MLF ranking is a blend of both FLW and BASS sanctioned events taking into consideration each circuit's qualification criteria, and is based on the past 1 years (12 months), with a 0 tournament minimum, and includes BASS Elites, Bassmaster Classics, FLW Tour, Forrest Wood Cups, and TTBC events. Get the complete list of 2-year Pro Anglers - BASS Elites. The 2-year Pro Anglers - BASS Elites ranking is a blend of both FLW and BASS sanctioned events taking into consideration each circuit's qualification criteria, and is based on the past 2 years (24 months), with a 10 tournament minimum, and includes BASS Elites, Bassmaster Classics, FLW Tour, Forrest Wood Cups, and TTBC events. Get the complete list of 1-year Pro Anglers - BASS Elites. The 1-year Pro Anglers - BASS Elites ranking is a blend of both FLW and BASS sanctioned events taking into consideration each circuit's qualification criteria, and is based on the past 1 years (12 months), with a 5 tournament minimum, and includes BASS Elites, Bassmaster Classics, FLW Tour, Forrest Wood Cups, and TTBC events. Get the complete list of 2-year Pro Anglers - FLW Tour. Get the complete list of 1-year Pro Anglers - FLW Tour.